This post has been sponsored by Storytel. One of the best features of Storytel is that you are not limited to the audiobook version of a book. The service provides both audio and eBook version of the books so you can consume them in the form that you desire. The best part about the service is that both the versions of the books are available at no extra cost to you (more on the pricing details later). The service currently boasts of a catalogue of more than 7000 books from some of the best authors in India and the world. 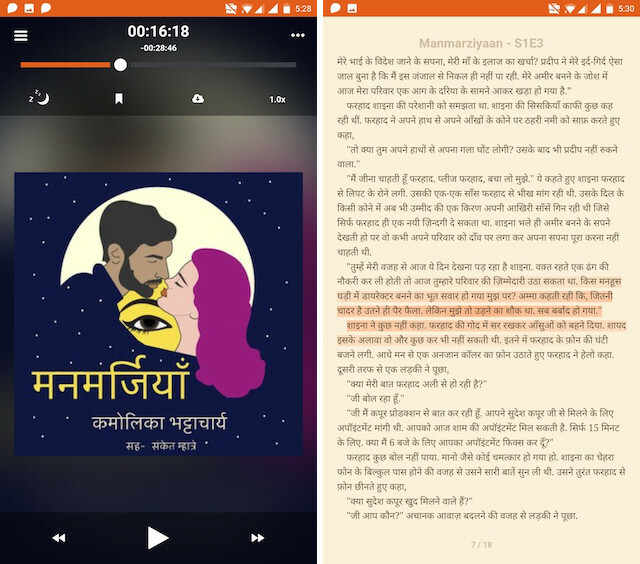 While there are a lot of things that I love about Storytel, the feature which made me subscribe to the service was the effortless sync between audiobooks and eBooks. Although the service does provides both the audiobook and eBook versions of books, it would have been pointless if a user had to physically mark his progress while consuming the book. However, thankfully the service automatically syncs a user’s progress between the audiobook and the eBook, making it really easy switch between both the versions. For example, if you are listening to the audiobook version of a book and have reached to say somewhere in chapter 5. When you switch to its eBook version, it will open directly at the line where you closed your audiobook. 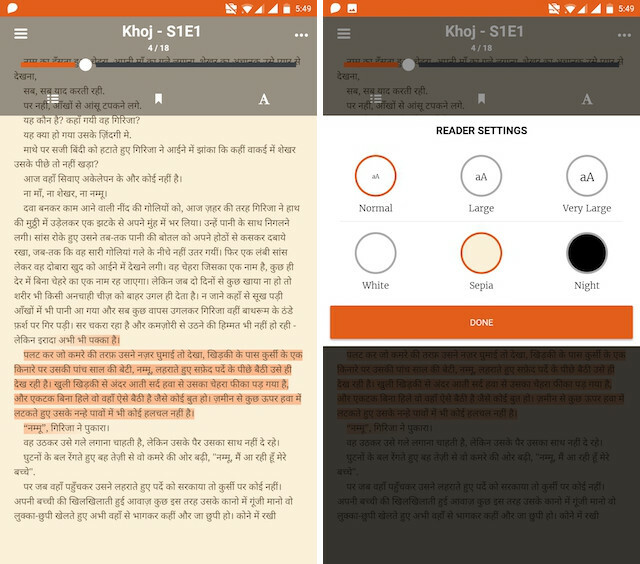 To help users find the exact line, the app even highlights the text till which the user has listened to the book in the audio version. The same happens when a user switches from the eBook version to the audiobook version. All one needs to do is tap on the line where he is finishing and the audiobook will be synced to that line. It is by far my favorite feature of the app as it makes switching between the versions a real treat. The biggest reason which pushed me to give this service a try was its selection of books from Indian authors. And no, I am not talking about a few Indian authors who have managed to publish books in English, rather the writers which publish their work in Hindi and are mostly left undiscovered. It’s sad that while most of us grow up with the stories of Ramayana and Mahabharata, we discard Hindi literature and novelists as soon as we are able to choose our own books. I was the same, however, it changed when I first read Munshi Premchand’s work, and have been following Hindi literature since then. Before Storytel, there was no other service which allowed me to easily consume works of Hindi novelist and that’s why I was so happy to discover it. What’s even better is that Storytel also houses books from regional authors. 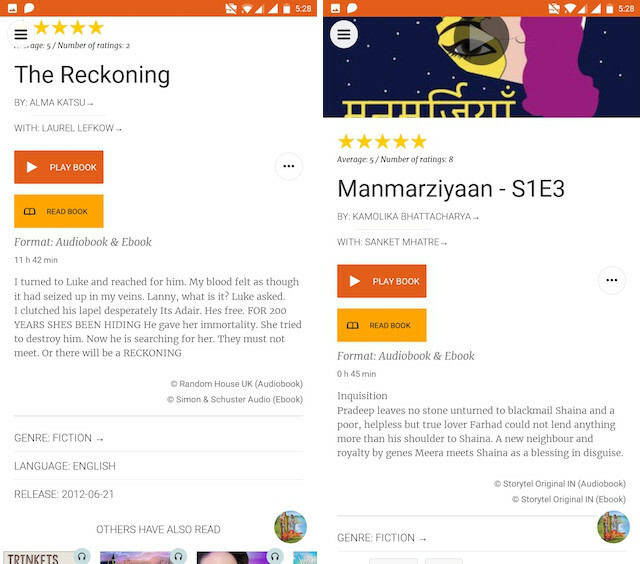 Right now, the only prominent regional language that is featured on Storytel is Marathi, however, I am quite sure that the service will add more regional authors in the future. 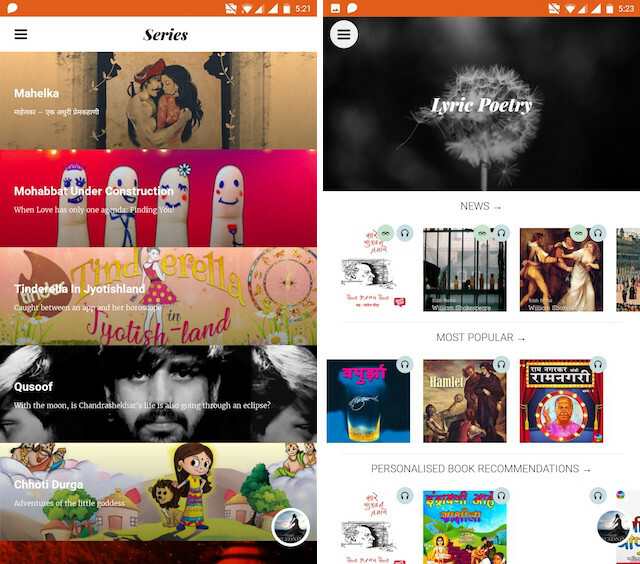 Another thing that is great about Storytel is that the service not only offers full-fledged novels but also offers short stories, poems, and serialized content. I especially love to listen to short stories when I am not in the mood to continue my novel or I just want to listen to something light. I have also started giving a try to serialized content which is basically a tv-series for your years. 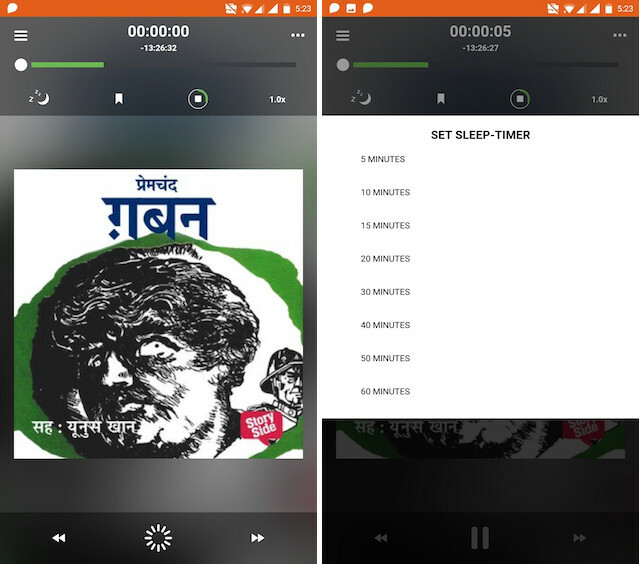 The audiobook player that is included in the app is pretty straight-forward and packs almost all the features that one expect from a good audiobook player. I love that the forward and back button can be long-pressed to quickly and easily skip to the part that you want to go to. You can also change the audio speed and set a sleep timer. I do wish that the audio speed changer was a slider which gives a more precise control, but other than that I am happy with the player. The built-in eBook reader that comes with Storytel is fairly basic and offers only a few features. There’s a button which easily allows users to switch between the chapters, a button to bookmark a page, and a button to change the overall appearance of the page which includes the page background and text-size. It’s apparent that although the eBook reader gets the job done, the Storytel app is a primarily an audiobook app and the eBook functionality has been just added to enhance the overall experience and was not a priority for the development team. The user interface of the Storytel is probably its weakest point and needs improvements. Don’t get me wrong, it’s not bad, however, it is confusing, especially if you are using the app for the first time. The major problem that I faced was with the naming scheme of the certain parts of the apps which made navigating the app a little bit cumbersome. For example, when you swipe from left to right to access the hamburger menu, the first sub-menu is titled as “Book Tips”. Now, before you read further, just tell me what comes to mind when you will see the sub-menu item for the first time. Whatever comes to your mind it certainly will not be “Home” which is what this sub-menu is. It’s basically the home page of the app which houses all the book titles which are either featured or popular or suggested. Similarly, the featured section is titled as “News” which confused me a lot, so much so that I am still not sure if its the featured section or the latest arrivals section. That said, if you can get over these nomenclature mistakes, the app is fairly easy to navigate. Just slide from left to right to access the hamburger menu and you will find all the options there including the search option. You can browse books by either selecting titles from the home page, or you can go to the categories section and browse by genre. If you know what you are looking for, you can search for it either by using the title of the book or by the author. One thing I love is that the search bar supports not only the English language but also Hindi and Marathi, making it easier to find Hindi or Regional titles and authors. Then there are the little things that I like very much. When you tap on any menu item, it bobbles for a split-second which looks cool. I also love that when you are browsing the app while listening to an audiobook, there’s a small circular logo which keeps on rotating. The logo shows the cover page of the novel which you are listening to and allows you to switch to the player just by tapping on it. 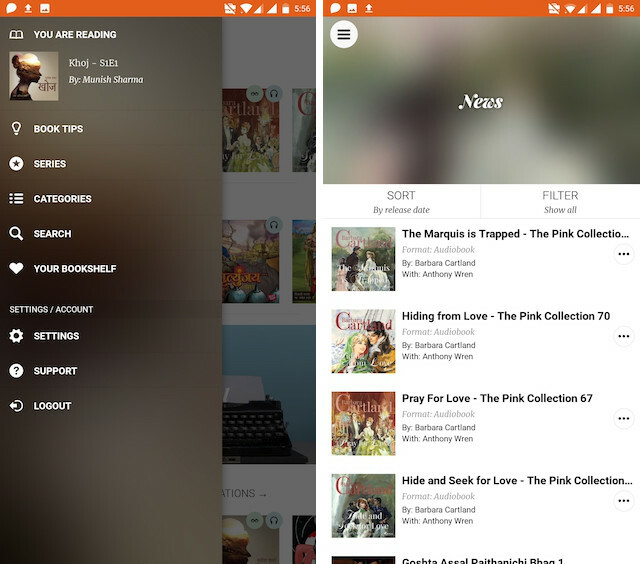 The bottom line is that you will need a few minutes to adjust to the app, but once you do, it’s as easy as any other audiobook app out there. Storytel is a subscription-based service and you will need to pay a monthly subscription fee to enjoy this app. That said, once you subscribe, all the content inside the app is free to listen or read. The service offers a 14-day free trial period, however, if you use our link, you will get a 30-day trial period, which is more than enough for you to check out the app. Once you do decide to subscribe, it will cost you Rs. 499/month. 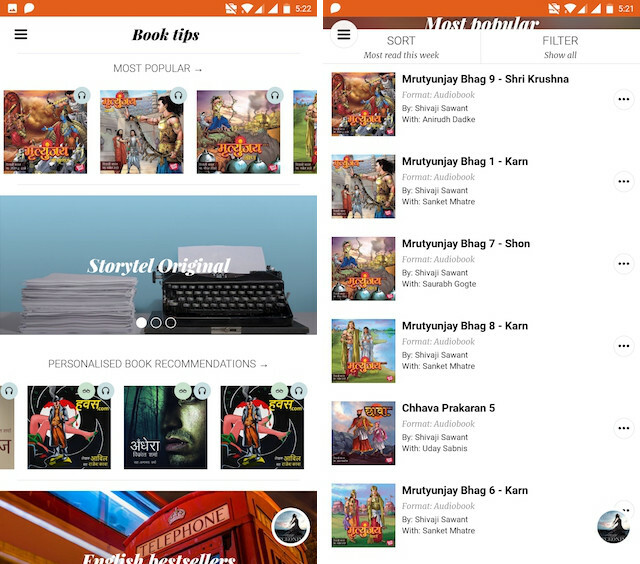 Storytel is the first service of its kind which provides Indian consumers with a large selection of novels, short stories, poems and more from Indian authors. 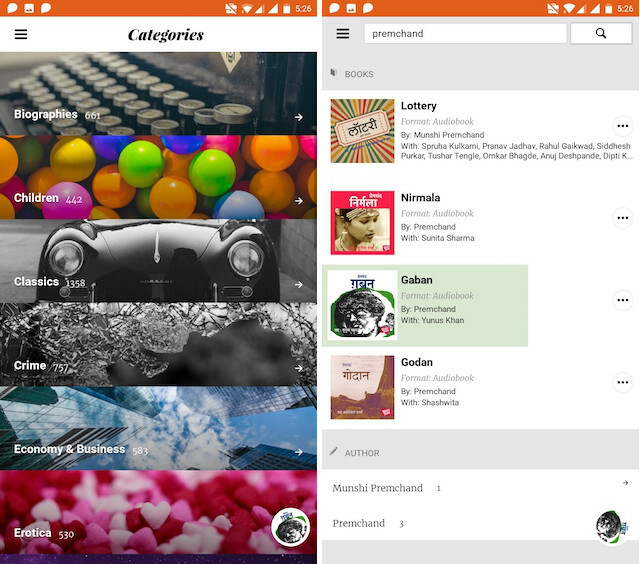 The service not only features content in Hindi but is also improving its content catalog in regional language. If you are a fan of Indian literature and novelists, Storytel is the best place to consume their work.